Happy Friday! It has been a long week, so I am so happy that the weekend is (almost) here! Today I'm linking up with the lovely ladies of The Good Life, Carolina Charm, A. Liz Adventures, and Hello Happiness for everybody's favorite link up, Five on Friday! There is something about puppy chow that reminds me of winter and the holidays. I think it may be because in high school, for every volleyball season (which was, at that time, during the winter), someone on the team would be tasked to make puppy chow for the weekend tournaments. Either way, it is oh-so yummy! 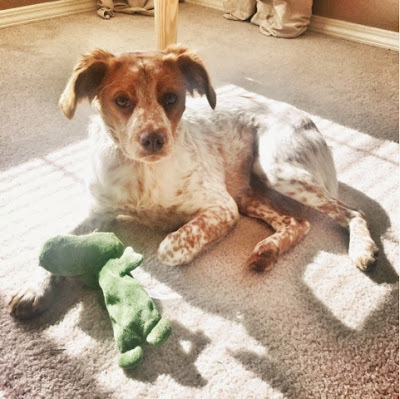 Scout is currently in the stage where she destroys every toy she gets as fast as she can. So, in the spirit of the Florida vs. Florida State game this past weekend, my husband (an FSU alum) bought Scout a gator to beat up on. John has been very much enjoying Florida State's football success this year... so much that the thought of them losing stresses me out considering what it would do to his heart. Please just pray that they win this weekend's game so that they can go to the National Championship. 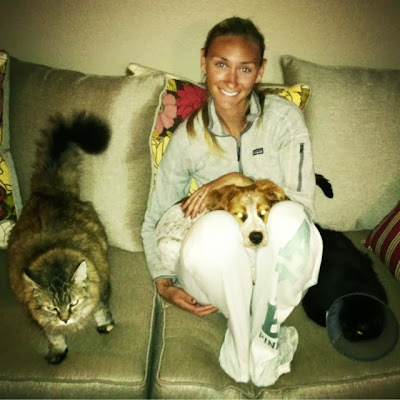 The picture of Scout on your lap on the couch is adorable! I sure do miss that little puppy. Your Christmas card is also perfect!! Happy Friday chica!!! 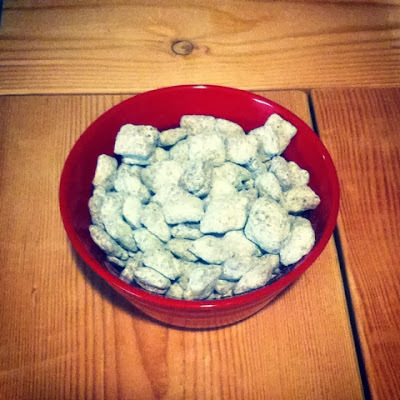 I love me some puppy chow, so yummy! 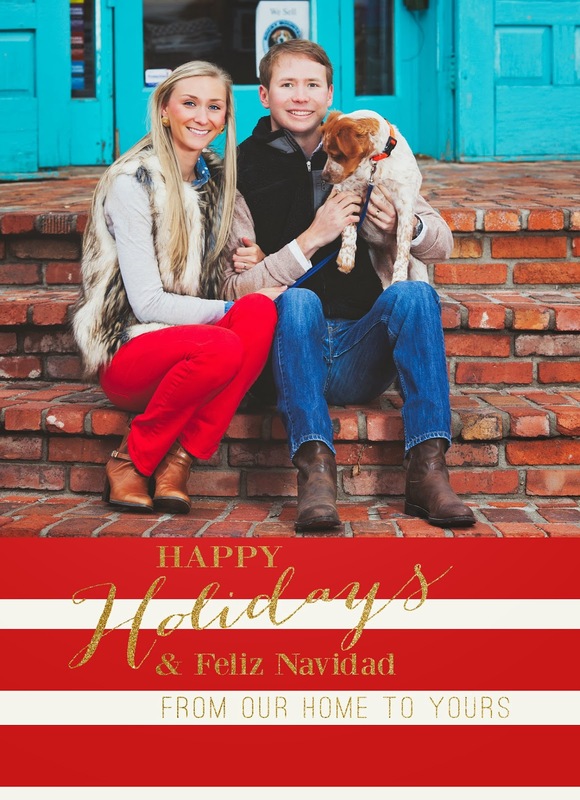 Your Christmas card is so lovely, love the colors and your outfit is awesome! Love that picture of scout. So cute. And your Christmas card is perfect! I love how colorful it is! 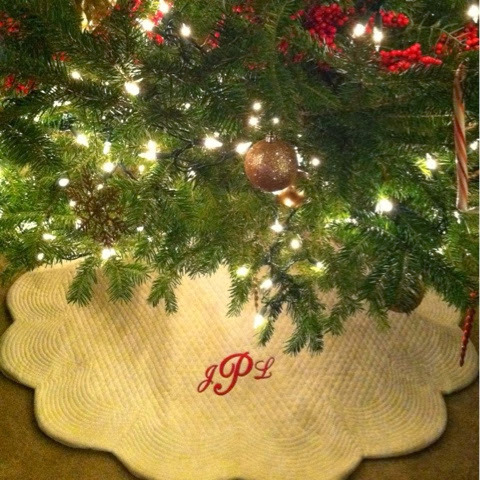 Now I'm on a mission to find a monogrammed tree skirt - what a cute idea! Your Christmas card is adorable! Hi, Samantha!! I actually bought my tree skirt from Target and then took it somewhere to be monogrammed! 1. I love that tree skirt!! I have never seen a monogrammed tree skirt before and I love the idea. 2. Your Christmas cards are adorable! !